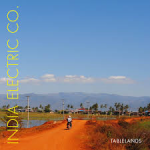 Share the post "EP review: INDIA ELECTRIC CO. – Tablelands"
The India Electric Co. return with the final part of the EP trilogy which contrasts the city and country. The wonderfully talented duo Cole Stacey (vocals, percussion, gravel) and Joseph O’Keefe (violin, piano, guitar, accordion, harp, percussion) take us on five further musical adventures. Opener ‘Only Waiting’ perfectly mixes Balkan music with a memorable pop melody. Elsewhere, we have the swirling violin on the ‘In Absence’, the most traditional folk tune on the EP. ‘Lila’ has a jazzy swing in the backbeat, topped off by Cole Stacey’s melodious and soothing vocals. ‘Mareeba’ with its mournful strings, is a town in Queensland and the song highlights a town living beyond its means. ‘Gold In The North’ completes the EP, looking at how the city can hold all the riches, whilst there is nothing much left in rural areas. The guitar and violin work effortlessly off each other, whilst Stacey provides an impassioned vocal. This entry was posted in All Posts, Single and EP reviews and tagged acoustic, blues, EP, folk, India Electric Co., jazz, Midge Ure, pop, review, Tablelands. Bookmark the permalink.